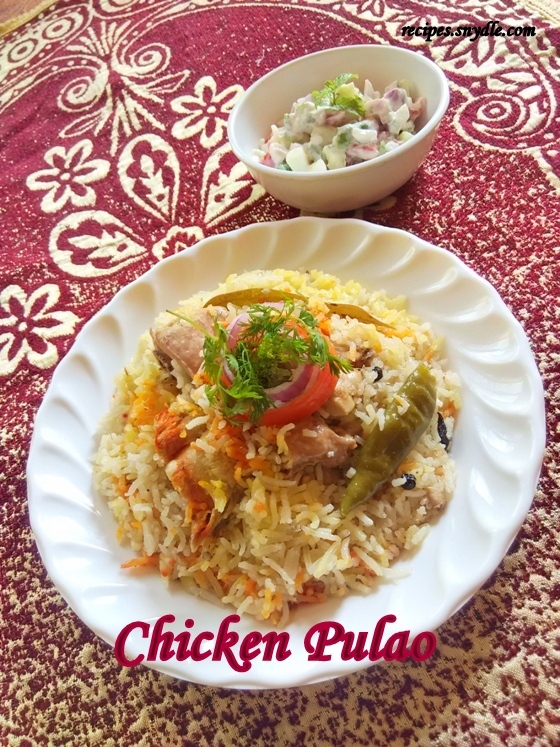 How to make Chicken Pulao Recipe/Chicken Dum Pulao Recipe with step by step pictures. Zest chicken rice tendered with Indian spices. 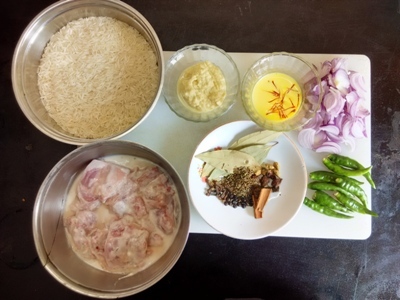 This is an easy and simple to make chicken pulao recipe. Pulao has mild flavor as compared to biryani. 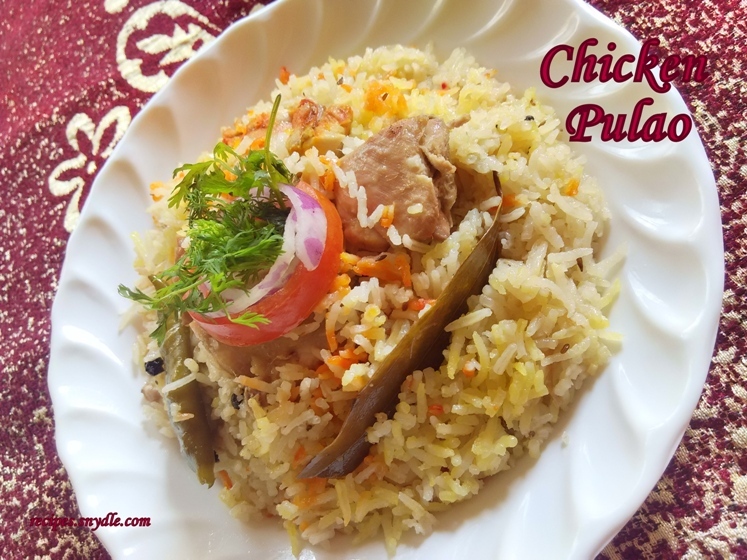 In this recipe of chicken pulao you can replace chicken with meat or beef. This recipe do not contains powdered spices, only whole spices are used. 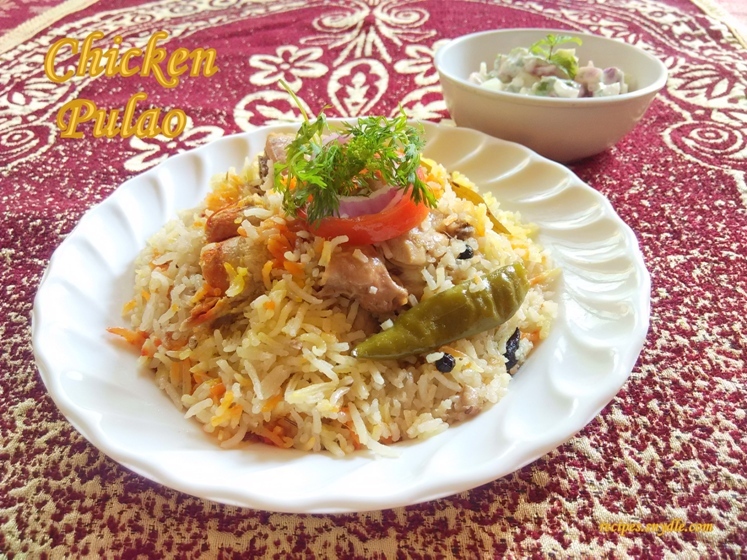 This delicious chicken pulao is somewhat similar to chicken yakhni pulao. 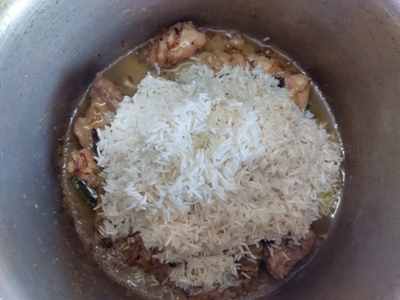 In chicken yakhni pulao recipe all the spices/garam masala like Laung/cloves, black pepper/kalimiri, cardamom, bay leaves/tezpatta, black cumin seeds/shah jeera and star anise/chakriphool are tied in the muslin cloth and a spice bag is prepared. This spice bag is added to the cooking vessesl in the same step when I had added the garam masala to the cooking vessel. It too tastes delicious. We often make Chicken and mutton pulao twicw or thrice a week. 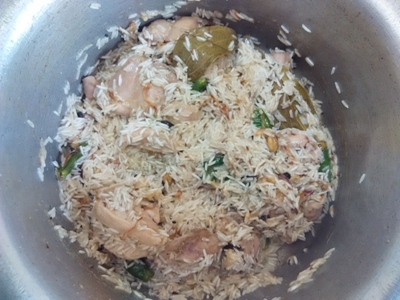 Chicken pulao recipe is easy to make recipe when the surprise guest come up. Chicken pulao can be had with some side dish like raita or salad or mirch ka salan/curry. Mirch ka salan/curry is a hyderbadi recipe usually had with pulao and roti/Indian bread. Chicken biryani is too spicy and for some people it results to acidity during summers. Chicken pulao contains mild spices and can be had during summers. 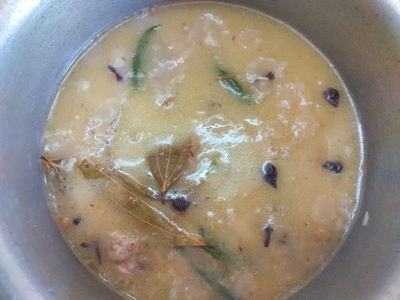 Saffron/kesar soaked in milk is addes to the chicken when it is completely cooked. 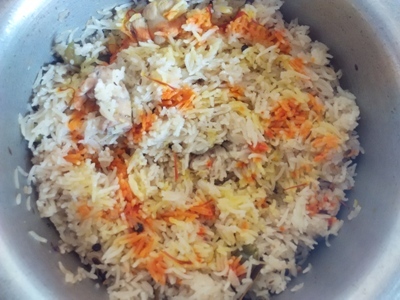 It gives a good saffron colour to the pulao rice. You can also use food colour. 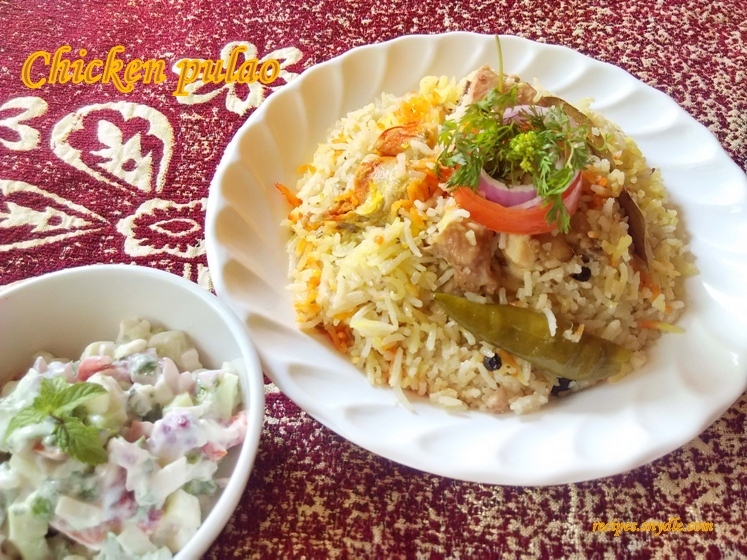 Serve the chicken dum pulao hot with salad. Here I have finely chopped onion, cucumber, coriander leaves and tomatoes mix together with curd/dahi and a pinch of salt. Coconut milk too can be added instead of water. 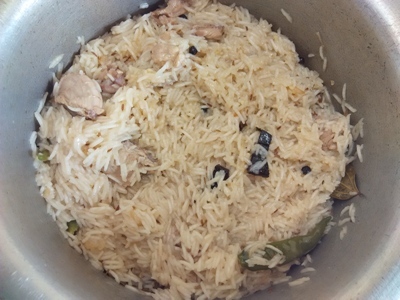 Chicken pulao can be prepared in pressure cooker as well. Follow the same procedure. Close the lid of the pressure cooker take a whistle on high flame and recuce the flame to low for 10 minutes and off the flame. 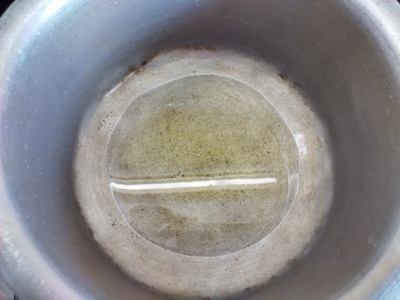 Do not open the lid of the pressure cooker until the pressure cooker cools down or the heat inside settles down or the pressure gets off that is to say about 4 – 5 minutes. This recipe of chicken pulao yields 4 servings. For the purpose of measurement, 1 cup = 250ml. Star anise/chakriphool – 3 – 4 nos. 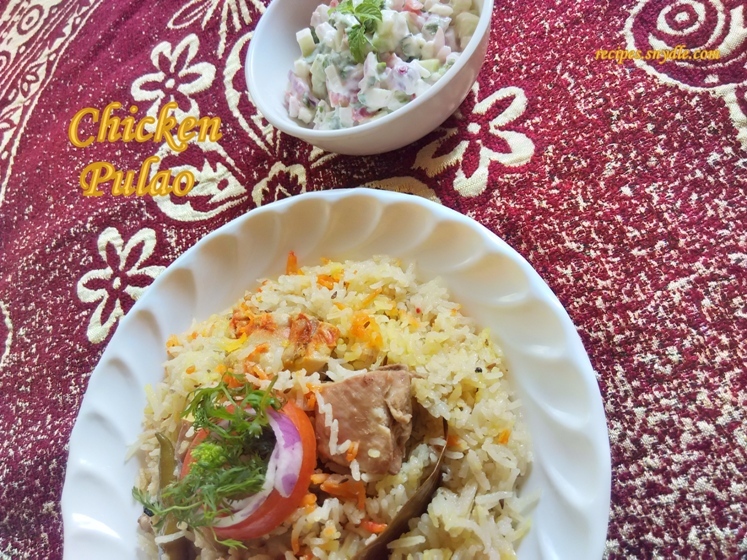 How to make Chicken Pulao/Chicken Dum Pulao. Prep your ingredients. Soak the kesar/saffron strands in milk beforehand. Wash and drain the chicken well. Place chicken in a bowl. Add salt and curd/dahi to the chicken. Mix them well with your hand. Allow it rest for 30 minutes. Heat a cooking vessel. Add oil to the cooking vessel. 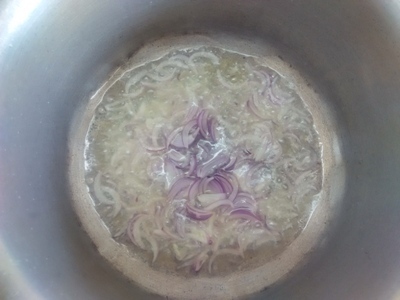 Place sliced onions into the hot oil. 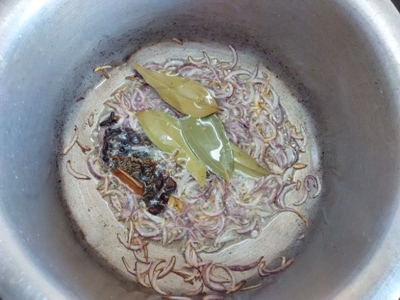 When the onion turns to light brown colour add all the garam masalas which incudes Laung/cloves, black pepper/kalimiri, cardamom, bay leaves/tezpatta, caraway seeds/shah jeera and star anise/chakriphool to the onions. Mix them well. 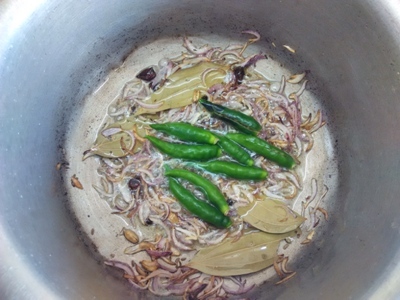 Add green chillies to the garam masala and onions. Mix it well. Add ginger and garlic paste to cooking vessels. Continuously stir it. 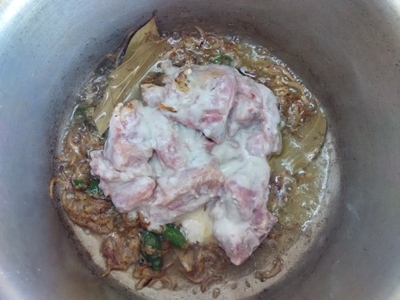 Allow it to cook and gets golden brown colour on medium flame. Now add marinated chicken into the masala and mix it well till all the masala coats the chicken well. Wash and drain rice. Add the rice to the chicken. Mix it well till all the masala and chicken coats the rice well. Add water and salt to the cooking vessel and stir it. Increase the flame to high and allow it to take a boil. After a boil reduce the flame to low and allow it cook on low flame. When the water reduces and rice is almost cooked, stir it once. Cover the cooking vessel with a lid and allow it to cook on low flame. After 5 – 10 minutes open the lid from the cooking vessel and check a piece of rice and a piece of chicken if completely cooked or not. Add the soaked kesar /saffron strands with milk on the pulao rice. You can also use food colour. Chicken pulao is ready to eat. Garnish the chicken pulao with onion and tomato rings and a coriander strand. Serve hot with salad. Salad is prepared by finely chopped onion, tomato, cucumber and coriander leaves blended with curd/dahi and a pinch of salt. Enjoy! 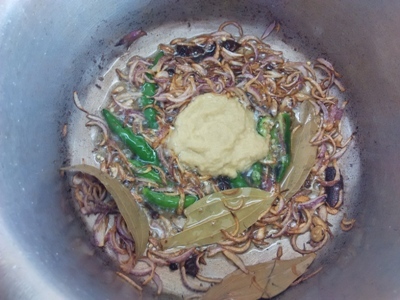 Previous Post: Masala Moong Dal Recipe.